When I first heard about TresOmega Gluten Free pasta options I will admit I didn't have the highest of hopes. GF pastas haven't been friendly to me in the past and the taste and texture of TresOmega was a pleasant surprise! It was as delicious as eating grain pasta and it is not only gluten free, it is organic as well. Score! While no one in my household is gluten free we have many friends who are due to varying reasons and I have purchased many products before trying to find a pasta that tastes similar to wheat pastas. Most have failed or been outrageously expensive. I am happy to know about TresOmega Organic & Gluten Free Pastas for the next time I cook for my friends who are Gluten Free. Since it is organic as well, I will make it for us as well. Who doesn't want to be healthy when they can and not lose out on taste. It is a win-win! This dish is the perfect comfort food and it is rather simple to whip up. 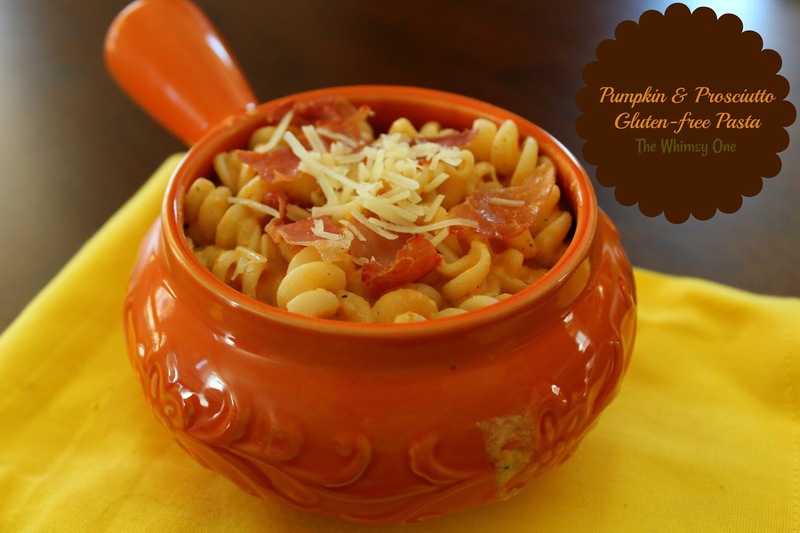 When I think of pumpkin, my mind leans towards savory as I am just not a fan of pumpkin spice. Pumpkin itself tends to just add a subtle flavor to your dish and it a paired perfectly with the salty prosciutto. The pinch of red pepper flakes added just another layer of flavor. Make this for a group or half it and enjoy a quiet meal at home! This recipe is for using the whole box of pasta. If you like a thinner sauce, add a little more half and half and if you prefer a thicker sauce, feel free to add a little more cheese! Just remember if you are making this recipe for friends who are gluten-free that you make sure all other products are also gluten-free. Certain cheeses often times are not so I made sure to look for brands that are safe! In a saucepan, start your water to a rolling boil. With Gluten Free pastas it is imperative you follow directions for cooking time and amount of water to use. It definitely makes a difference in how they taste! Once it is boiling, add your pasta. In a separate saucepan add in the half and half and whisk in the pumpkin. Make sure they are totally combined and add in the cheddar and parmesan making sure to continuously whisk. Add your salt, pepper, and red pepper flakes. This is to taste so choose the amount you would like. You can also add a dash of dijon mustard and sriracha if you like a sharper taste with a little more spice. Make sure to whisk thoroughly so not to let the cheese become stringy. Chop the prosciutto and saute til crispy. set aside. Once the pasta is ready; drain and place back in the pan. Pour the pumpkin cheese sauce over the pasta and toss together making sure to coat all the pasta pieces with sauce. Place the pasta in a serving dish and top with the crispy prosciutto and sprinkle on more shredded parmesan. TresOmega offers a lot more than just pasta, they have fantastic organic coconut oil, sugar, and flour for your healthy cooking pleasure as well! You can purchase TresOmega at these stores on line and follow along on their social media! 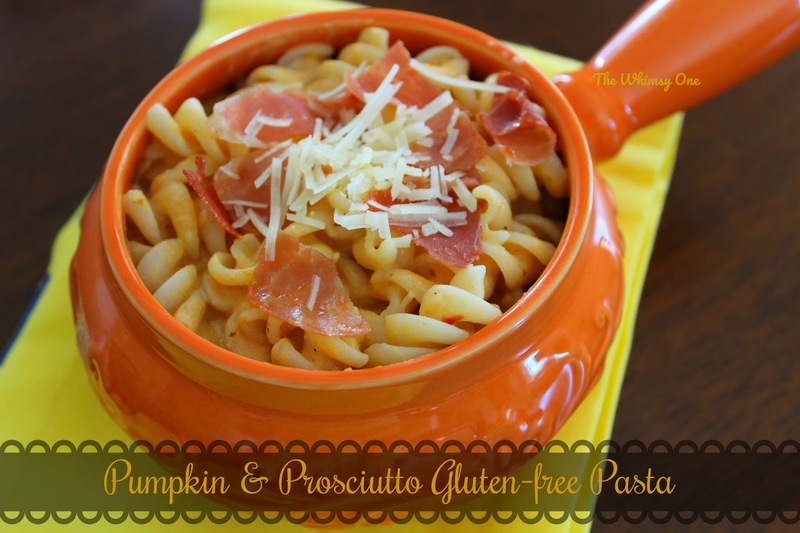 1 comment on "Pumpkin & Prosciutto Gluten Free Pasta"
I will check out this recipe. I enjoy cooking, actually. Thank you!